eBay has over 168 million active buyers and it’s growing daily. So how do you make your listings stand out from the crowd and convert to sales? Let’s run through the six key features every eBay listing needs to entice customers and convince them to buy. An image speaks a thousand words – it may sound cliché, but its true. Images are an important part of your item description. More than half of online shoppers think that product visuals are more important than product information, reviews, and ratings. Images are a key part of the description and should be clear and not misleading. eBay only allow sellers to use manufacturers photographs if the item they are selling is new and unused. Your listing title and the feature image are all a potential customer has to judge your listing by when they first search. If these two things are not good, customers will scroll past your listings. The eBay search engine, Cassini, also looks at your product titles. Be sure to use core product key words that describe the item. You can use up to 80 characters in your product title. Titles should be written for buyers. Writing in a smooth, readable way will get you the best engagement rate. A pile of keywords thrown together won’t attract customers. Qualifiers such as designer, material or colour are helpful to a customer and Cassini. However, using other brand names with phrases such as “just like” breaches eBay rules and will result in listings being taken down. Even if eBay don’t remove them, this weakens customer engagement, so damages ranking. Special characters are still sometimes seen in eBay titles. This is an outdated technique for catching customer attention. It only irritates modern customers and is seen by eBay as a bad practice. So, it won’t help your listing ranking in eBay search. If a customer gets to your item description, they are seriously interested in what you’re selling. Your item description is your chance to answer any possible questions that may be causing hesitation, and close that sale. It’s a chance to speak as your brand and share advice with potential customers. Show how much more knowledgeable, helpful and trustworthy you are than other sellers. Don’t just use the manufacturer’s description. For fashion items, always give full measurements. Go further and anticipate what the customer may be asking. For instance, if you’re selling swimwear, does it stay opaque when wet? Going into this detail shows deep product knowledge and customer care, so potential buyers would be more likely to purchase from you. Custom branding sets you apart from competitors and keeps customers in your listings for longer. Not just exciting visuals, custom eBay design can include extra sales features like video in listings, dynamic cross promotion and software for motors and motor parts sellers. It’s important that your customers know who they are buying from. If you sell great products and give excellent service, then you should brand that experience so that customers can be loyal to you. Professional branding design in a listing makes it clear that you are a professional seller and encourages buyers to trust you. They know that you’re invested in eBay and your company appearance, and that they can trust that you are here to sell in an honest and professional way. 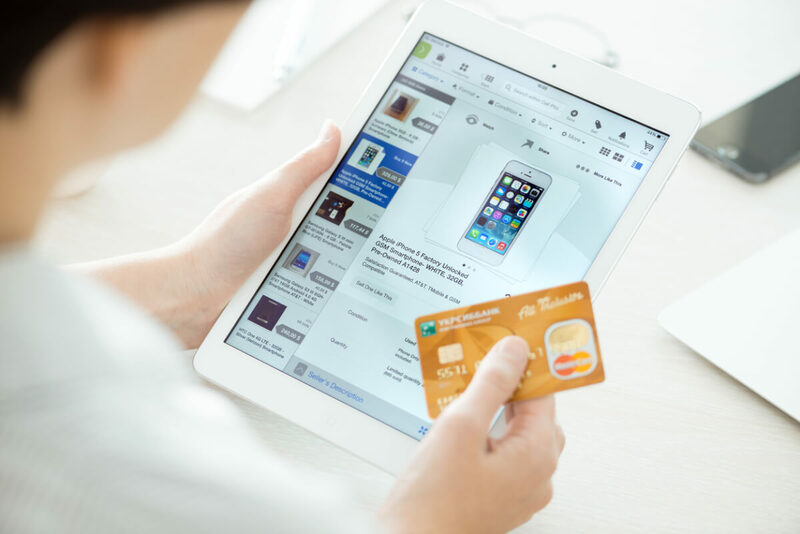 For this reason, customers are more likely to trust postage estimates and product guarantees from sellers with custom branded eBay listings. Cross promotion is one of the most powerful techniques in retail. From McDonald’s ‘would you like fries with that?’ to Amazon’s ‘others also bought’, cross promoting items has been the catalyst for many of the world’s biggest brands. Cross promotion works because of its timing, hitting people with offers when they are at their highest point of intent to buy. When a customer is in an eBay listing, they have high intent. Presenting them with extra offers of items to buy at this point is a sure way to increase your purchase rate and basket values. To cross-sell effectively, the most important point is to cross promote products that naturally pair well, like shoes and socks. You must decide, what is the sock to the “shoe” that you’re selling? Pay special attention to the price points of the items you pair, and cross-sell products are typically similar in cost. If you are selling a laptop for $1,200 a printer for $100 would be a logical cross-sell, but if you are selling the printer, the laptop would be too big a purchase for the cross-sell. Better to suggest a pack of paper, or extra ink cartridges. It is important that you only ever cross promote to live listings. Cross promoting to a dead listing is pointless and will very likely lose you sales. This is why your eBay cross selling feature must be dynamic. Dynamic cross promotion scans through your live listings, and automatically shows related products, based on the rules you set. The rules could be size, colour, any relevant feature. It will only connect listings which are relevant and live. All Frooition cross promotion is dynamic. Pro Tip: If you don’t offer free shipping, combined shipping on multiple items is a powerful extra incentive for customers to buy from cross-selling. When people search on eBay they will often start by searching a broad product term, and then narrow their search down using the options in the left hand column. 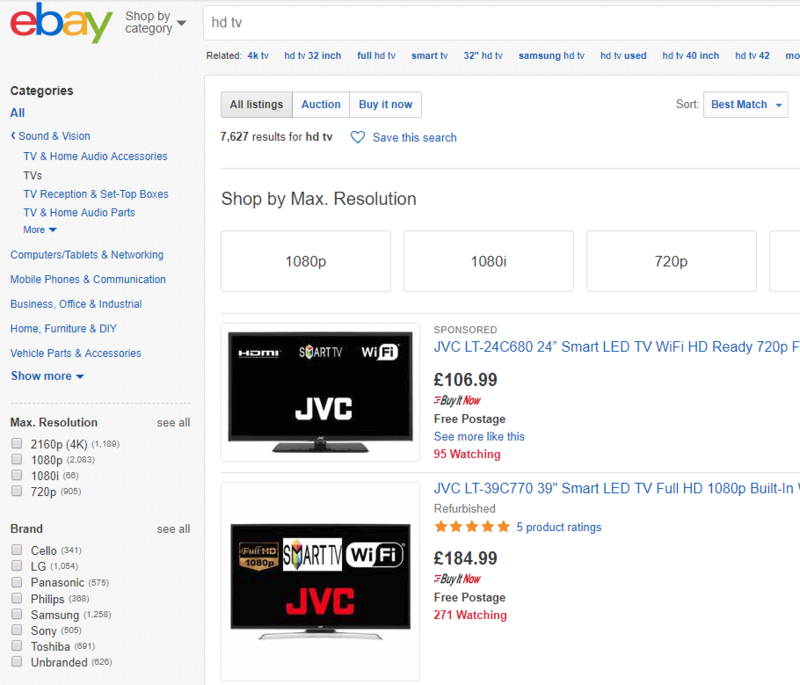 For instance, if we go to eBay and search for ‘hd tv’ we get 7,627 results. No one is going to want to scroll through all of that. So, in the left-hand column we can refine our search using filters. If I choose to filter to just Samsung, that cuts the results down to 1,258. This is typical behaviour for buyers on eBay. But if we look at all the brand options, 292 results are unspecified. Looking at the listings with unspecified brand, there are LG, Sony and Samsung televisions. 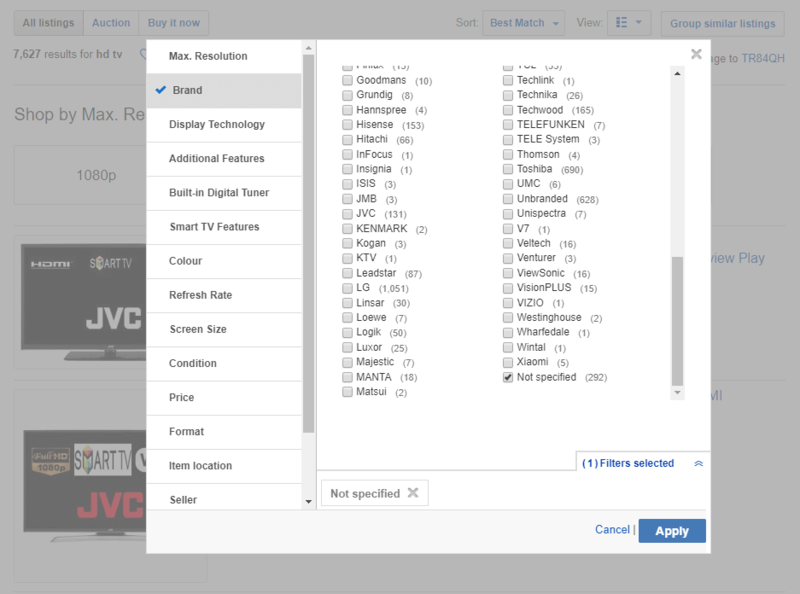 Although one of these results has the word Samsung in its title, it would not have been included in the results when we filtered for Samsung televisions. If items are listed without full item specifics, they will not show in refined searches.